Once you’ve mastered the basics of betting in poker, it’s time to start adding a few more advanced moves to your arsenal. Whether you're playing poker online or in a land-based casino the check-raise is one of the most powerful moves you can make - the idea is to lull your opponents into thinking they have the upper hand, encourage them to fill the pot and then move in for the kill. The move itself is quite simple. When acting out-of-position (with one or more players waiting to act after you), try to resist the temptation to bet - instead, check the hand through and hope that one of your opponents makes his move. When they inevitably do, that's when you swoop in with a decent sized raise and either force a fold or create a giant pot for you to win later on. For beginners, the best way to use the check-raise is to get value out of your hand - it will be most effective if you have the upper hand in a flush or straight draw, or if the cards on the table are no match for yours. With a well-timed check-raise you will be able to convince players with weaker cards that they could potentially win the pot, giving them the confidence to pile their chips in under the assumption that they have you beat. This means that when you do win, the pot will be much larger than it would of been had you snap bet at the first opportunity. The more experienced players, however, may want to try using this move as a new way to bluff. Because your check followed by a forceful raise shows a willingness to risk so many chips, it will instantly put your fellow players on edge, making them nervous about your hand and forcing them to take a more considered approach to their next move. When you choose to bluff is up to you, but the move works best when the table cards are drawing a blank, or there is an outside chance of a flush draw later down the line. Remember, though - this is a very high risk strategy. If you bluff with nothing and your opponent stays firm or has a monster hand, you could potentially lose a sizeable chunk of your stack. It's also important to make sure you only check-raise when you're out of position and there are two or three players ready to follow you. If there aren't enough playing after you then your chances of forcing a bet are limited, but if there are too many you may be giving someone else a chance to pull exactly the same move. Check-raising can be a fun way to inject a sense of drama into your game, but you should always use this technique with caution. 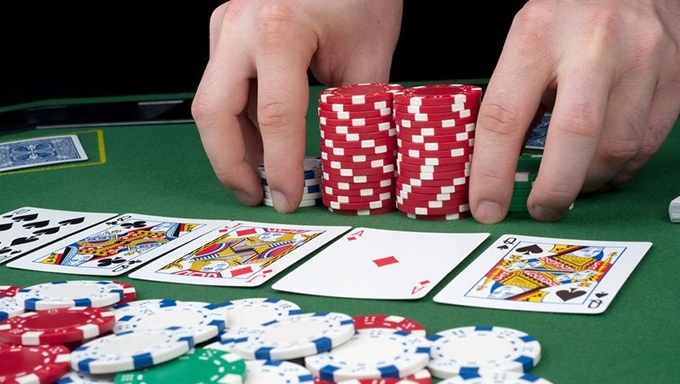 If you get called out too many times your opponents will start to learn your game, and if it goes wrong you can be in big danger of losing a lot of chips. If you're nervous about trying out your new moves in a real casino, hone your skills online at 888 Poker today and you'll soon be check-raising like a pro.